So far what we know of Titan has come from the Cassini spacecraft that orbits Saturn. In recent years Radebaugh led the discovery of Titans mountains and sand dunes based on images and data beamed back to Earth by Cassini. Thats why Jason Barnes, a former grad school classmate, invited her to work on the Titan airplane concept alongside researchers from NASA and the Naval Research Laboratory. To get a closer look, the proposed drone would operate on a nuclear battery barely strong enough to power a couple light bulbs. The battery would power a propeller except when it needed to beam data back to radio telescopes on earth. Prior to these transmissions, the drone would climb high into Titans atmosphere. Then power would shift to the radio cone in the drones nose as the aircraft glided back down to its usual flight altitude. While transporting the drone to Titan would take up to 7 years, the communication relay time once its there is a mere 90 minutes. Forget about "someday". They should totally do this. Now. There are a number of technical challenges they need to look at first. The atmosphere there is thought to be loaded with dust and aerosols, with liquid condensation and precipitation. That makes for difficult flying conditions. You would need to make sure that you don't get a build-up of mud on the aircraft, especially on camera lenses. Imagine flying through a sand storm in the Middle East, only there's liquid aerosols mixed in with the dust. It is a very dirty place. 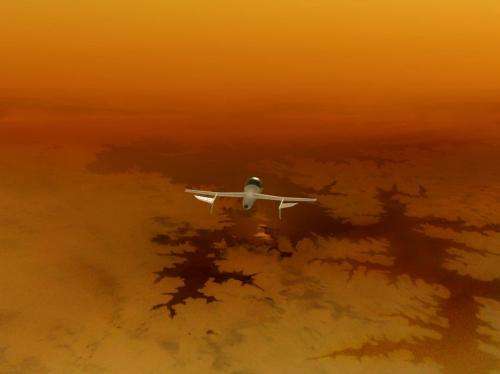 The artist's conception above may be very misleading (if currrent theory about Titan is correct). That microscopic dust might make life hard for bearings in your propeller too. Also keep in mind that the sun is a tiny little thing from Titan's point of view. The view from a real aircraft flying as the artist shows would be more like total darkness, even in the day. Sand storms get fairly dark, even here on Earth where the sun is bright. The atmosphere there is thought to be loaded with dust and aerosols, with liquid condensation and precipitation. This probably depend on what altitude you're at (though I have no clue as to Titan's meteorology). If Earth is anything to go by the aerosols and precipitation becomes less of a problem the higher you go. Pointing them backwards with a modicum of shielding on the sides should do the trick. Mars rovers seem to manage. Could be an enclosed system (except for the propeller, of course) with magnetic bearings. Since it needs no combustion there's no sense in exposing more than is needed to the atmosphere. Infrared, radar or microwave imaging should still give good pictures. I think it would be best to place an orbital satellite to measure wind velocities, composition of atmosphere, etc. THEN design a plane to withstand these conditions. Flying above the dust and clouds wouldn't help us much. All you would see is clouds, and we can see that from space. Current info we have on Titan says that aerosols condense on dust particles high in the atmosphere and grow until they become heavy enough to fall to lower, more dense parts of the atmosphere. That info is available from many different sources. Control surfaces must have hinges and joints. Fine dust on the moon was able to get into the sealed joints of the space suits. It's a very difficult engineering problem, with trade-offs between different solutions. No moisture on Mars. Dust, not mud. All you would see is clouds, and we can see that from space. Really depends on what kinds of sensors you use. We already do image the surface from space through the clouds. But with such a plane the distance is much less so the images would likely be much better (and we'd get full coverage over time). Control surfaces must have hinges and joints. This, too, could be enclosed. There's no reason not to have a membrane cover the entire surface of teh craft. Think of it like a manta ray: It manages to steer even though its control surfaces expose no joints to the medium. Hey, with such thick atmosphere an undulating mode of propulsion might actually work instead of a propeller. Small, hydrogen filled buoyancy fixtures could create major upthrust. Indeed, why not a blimp? Would be much easier to keep it flying, and very little power consumed for propulsion. Because that would not be a novel mission. The NASA TSSM mission is (or rather was) in the pipe. The view from a real aircraft flying as the artist shows would be more like total darkness, even in the day. Not correct. Cassini probes already made photograps there, and there was more than enough light for it. In fact the artist impression looks like the Cassini Huygens real pictures. Even more, cameras have to be more complex at earth atmosphere, where there is too much light and hard contrast and it is easy to saturate sensors. Also drones are more complex for earth, lower gravity and much denser air means that much less energy is required for flyng. And no other air traffic nor terrorist fire to take into acount. yes, all of that is true. Like I said. Tricky engineering with trade-off for various solutions. Weight, etc. Remember that the aircraft would also need to unfold from its capsule. A seamless design would be difficult, but as you said, membranes could minimize the seams. Membranes that stay flexible in extreme cold also place a constraint on how far that idea can be taken. As for undulating wing propulsion, the design with fewest moving parts is probably best. That would be cool, but something resembling a tomahawk cruise missile with a propeller on the back is probably more practicle. I'm not sure about that. I hear Al Qaeda is already set up on Titan and our Moon. "The Huygens probe was unable to detect the direction of the Sun during its descent, and although it was able to take images from the surface, the Huygens team likened the process to "taking pictures of an asphalt parking lot at dusk"
btw, they only took one picture from the surface. The probe only worked for about 90 minutes after landing. The picture is false color in a limited spectrum, since only a few wavelengths can get through the atmosphere. I should have specified that the artist's conception wouldn't look like that to human eyes. For our eyes, it would be like complete darkness. "landing site, which, surprisingly, became clearly visible only below 25 kilometers altitude"
So even with cameras designed to see through, they couldn't see the ground till below 25 km. There's the answer about how low to fly. I have thought for some time they should send some planes or blimps for extended missions on Venus. I think Venus is more interesting than Titan (and Mars, for that matter). I disagree. Since Titan is the only place we know of aside from Earth which has flowing liquid on the surface, Titan is really cool. Europa is my top pick though. The largest liquid water ocean in the known universe has GOT to be explored some day. This is speculation on my part, but I will guess that you find Titan and Europa so interesting because they may host some kind of life. This does make them very interesting, but I think the probability of finding life is so high that I won't be surprised if it's found. And once it's found, ethical pressures are likely to prevent us from comprehensive exploration, mining, terraforming, etc. Venus, however, probably doesn't support life. It wouldn't be unethical, if it's possible, to engineer a microbe to sequester the carbon and split water/O2 from the sulfuric acid clouds. The carbon capture could have applications on Earth, and Venus would be the best place to set up long-term colonies if not for the hostile atmosphere. I think that I would want to refrain from sending anything through Titan's atmosphere that might result in a spark igniting the planet through some freakish reaction and turning it into a mini-sun that continues in some chain reaction to in turn ignite Saturn and begin the devastation that marks the final day. On the other hand, if we could deliver the right energy at the right frequency the way we move electrons around an atom we could coerce Titan into an orbit slongside ours around the sun so that we could use it to replenish our carbon fuel supplies as needed. You are aware that every day tons of material (meteorites) screams through Titans atmosphere, evaporsting/being turned into plasma/exploding/doing all sorts of high energy shennaningans? Methane is only explosive in an oxygen atmosphere. Titan does not have an oxygen atmosphere. Wow. That is the most crazily uninformed idea I've read all week on physorg. Beats cold fusion, neutron repulsion and aether theory hands down. Beats cold fusion, neutron repulsion and aether theory hands down. Do you believe, you're better informed than the NASA is? NASA also had teams to investigate Podkletnov's antigravity claims. Not everything NASA does pans out. I'll wait till they put out a technical paper. Yah - I wish that there were negative stars, sometimes. In this case, he probably is. The NASA "expert" you link to is an atmospheric scientist (and very well thought of) who's been totally bamboozled - it's not his area of expertise at all. It's just sad. Had a bit more of a think on the article. At such low power, as proposed for the aircraft, and with such a dense atmosphere this thing isn't going to go anywhere (planned) unless Titan's atmosphere is exceptionally devoid of any kind of air current or turbulence. It might not behave much differently than the Balloon proposed in the TSSM mission (i.e. getting shunted wherever the wind blows). I think we should check the weather conditions there carefully before dropping something flimsy into the midst of it.